Collins Booksellers - OAT 2017-2018 Strategies, Practice & Review with 2 Practice Tests by Kaplan Test Prep, 9781506219509. Buy this book online. 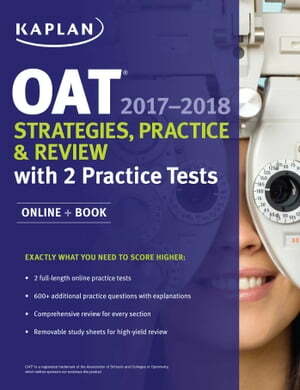 Kaplan's OAT 2017-2018 Strategies, Practice & Review provides the content review, test-taking strategies, and realistic practice you need to get the OAT results you want. Updated for the latest test changes, OAT 2017-2018 is your guide to facing Test Day with confidence.